Physicist Stephen Hawking and a Cal Tech colleague weigh in on science, the ultimate questions, and God. Physicist Stephen Hawking got the world’s attention a long time ago. The brilliant scientist, trapped in wheel chair and Lou Gehrig’s disease, whose mind encompassed the cosmos. In “A Brief History of Time”, Hawking laid out what we knew of the universe in compelling imagery and metaphor. Now he’s back, with physicist Leonard Mlodinow, for a cosmic update. Not one universe out there, but many, they say. And no need now for God to explain the origin of everything. Science, they say, will do it. Leonard Mlodinow, co-author, with Stephen Hawking, of "The Grand Design." Mlodinow is a physicist at the California Institute of Technology and author of "The Drunkard's Walk." 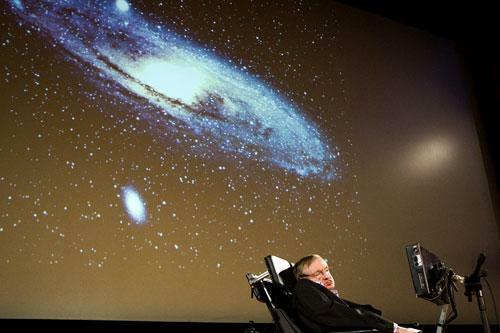 Because of his physical limitations and the live format, we will only hear Hawking via pretaped audio. This program aired on September 9, 2010.